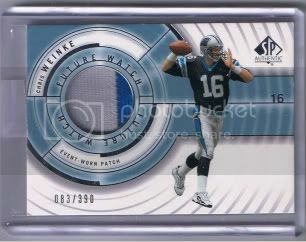 For some reason, Chris Weinke appeals to my wife and I try to add to her collection when I can. The card I chase after more than anything else is his 2001 SP Authentic RC /390. Every card is a patch, though some are one colored. The one that arrived today makes 9 for her collection.